Jennifer Cluff: Jaw motion for flute - Is your jaw jutting too much? Jaw motion for flute - Is your jaw jutting too much? One of my readers wrote to me regarding jaw use. If your flute teacher is telling you to "move your jaw forward and back" and yet you're reading articles, books and blogs by flutists who warn about excessive jaw motion it can be confusing. I'll refer you first to part 1 of 3, of Walfrid Kujala's "Jaw Boning" article. Walfrid Kujala and other flute teachers have written about how to use the jaw for dynamics, tone colours, intonation and for reliable and fast 'interval leaping'. These are all embouchure methods that combine abdominal air support and the angles afforded by a slight opening and closing of the lip aperture in a vertical manner. This is the opposite of sliding your jaw forward or "jutting" it forward and back to play the flute. 2. Why the smile embouchure doesn't work well on flute.
" If the lips are cushioned forward, we must learn to use and control the position of the upper lip which, for many flutists, [unfortunately] just hangs like a piece of dead liver while the lower jaw and lip dance around [excessively]." "The jaw can move up and down but it moves slowly, and in the process also changes the angle of the airstream as it moves up-forward and down-back. Thus the constructive bug in the mandibular joints, coupled with the effort to compensate for the unwanted motion (at least in flute playing, a more foreign act to the body than chewing) create another in a series of potential isometric [tensions]. To understand this problem, let us discuss the muscles involved in opening and closing the aperture in the lips. First, the ability to raise and lower the upper lip independent of the muscles at the corners of the mouth, and likewise to move the lower lip without "jawing", is essential to efficient, rapid, and smooth [legato during large] intervals. If you have ever observed an alligator wrestler doing his thing, you will notice that the essential defensive maneuvers consist of holding the beast's jaws closed....This is becuase the wrestler knows that the extreme weakness of the jaw-opening muscles are in no way reflected in the immense power of the closing apparatus. We too are better equipped for closing, tightening, gripping with the embouchure than for opening it." "I often prescribe exercises requiring a minimum of jaw motion while changing octaves so to increase the student's awareness of this mechanism (of using the muscles around the lips such as those used for sneering, pouting, pushed forward and back, in order to find the senstive area inside the lips, in order to control the size and angle of the airstream). Later, I add an explanation of how both the jaw and lips can move in any combination to acheive the desired results....My principal contribution in this area is the potential development of the opening and closing muscles, allowing a freedom of movement which can then be employed in conjunction with other means." "By jawboning, I mean constant change in the angle of the airflow into the embouchure (hole). Playing intervals of more than a third (for example changing from the lower to the mid-range), they seem to need a different thrust of the chin and/or an alteration of the shape of the lip aperture. My contention is that this practice is neither logical nor totally reliable......in a slow chromatic scale from mid range to low register there is no perceptible lip or chin movement. Jawboning [has a few small] advantages. It is useful for correcting intonation and in tapering off some long note diminuendos. It quickly becomes a mannerism if used constantly. Ninety-five percent of [large legato] intervals in our repertoire are under the octave. These require the involvement of the the whole body, not just the mouth and chin." Hope this brings out some comments from my readers!! Use the comment button below. Thanks for the video Jen. Its much easier to understand in video form. I apreciate your time and effort making this for us all. Thanks for your comment, Matt. Yes it *is* easier to see in video form than to read vague descriptions. "A Dictionary for the Modern Flutist," Scarecrow Press, April 2009. Thanks Sue and Sheila. Congratulations on the publication of your fab. flute dictionary Sue, can't wait to see it! And helllloooooo to you too, Miss. S. Good to see you after all your choir/voice/piano stuff! Thanks, Jen. I'm thrilled to say that my copy arrived today. I couldn't be more thrilled! Hi Jen, thanks so much for your video. I needed it a few years ago, when I apparently was jaw-boning and didn't realize it. I was in day-long rehearsals for a musical, and apparently when I was really tired, I got sloppy. I actually woke up with my jaw slid out of alignment to the side--and thus locked in place so I couldn't open or close--on the day of the matinée and evening performance. Ack! Fortunately, rolling on my other side and going completely relaxed (going back to sleep for a couple of hours, tough job but it was medically required ;-) fixed the problem. I woke with my jaw back where it belonged. It pays to learn to DO IT RIGHT folks!! Same disasterous open-mouthed jaw twinge happened to me also. Thank you so much for your very instructive videos! They're wonderful and I'm a big fan - keep them coming! Can i request an instructional video re: embouchure change between the lower - middle - high registers? I would be ever so grateful! I'd like to do a video showing embouchure changes, but.....it's very difficult to film embouchure motions with a camera, and also everyone's lips are different. The videos I have that show longtones are advocating that you seek your own embouchure using lip-ear coordination. Have you done alot of tone work with your teacher? Thanks very much for the video - I had a lesson last night and tried this out - too soon to tell properly but I think it's working. I found if I just THINK about having my jaw up or down, rather than conciously moving it, it moves just a bit anyway. The lips respond to the minutest of ideas, and the motions are very small, taking place at the very center of the lip aperture. Thanks for your instruction. In your video, you state that the angle of air changes from 90 degrees (orthogonal to the face) to about 15 degrees (from the chest I assume). This is the first I have heard of it. I am struggling to hit high C on the flute and wonder if I should be moving towards the 90 degrees. Most of my playing seems to be between 15 to 30 degrees from the chest. I did notice as I moved to high A and B, that I had to blow straighter and tighter, but always resisted moving to the full 90 degrees. Do I have this pictured correctly? Other recommendations on getting that high C and maybe even D? That is an excellent question. High C and High D suddenly take a very different embouchure than the B, Bb and A in the third octave. Roger Mather shows this difference in Vol. II "Embouchure" from The Art of Playing the Flute, in the charts for the Fourth Octave on pg. 128. Suddenly the blow hole has to be much more uncovered and the angle of the air much more horizontal. However when you make this change, the notes may be very sharp in pitch, so it takes a little getting used to. Instead of rolling the flute in a sudden manner to get the 1/4 lower lip coverage for high C, which you might think would work, you have to gradually uncover with the lower lip while directing the air downward with the upper lip. So it takes some time. What about what Moyse says in his book De la sonorite about closing the jaw slightly as you descend on the right hand notes and opening it as you ascend on the left hand notes? Opening and closing the teeth is fine. But jutting the jaw is the problem. First of all thank you for your answer and congratulations for this wonderful website. What I meant before is if you agree with the Moyse description of the use of the jaw. More closed for the right hand notas and more open for what he calls the less resistant notes of the flute, the ones on the left hand. Do you think It is right? The book is the famous "De la sonorité. Art et technique” and it is on the four first pages. 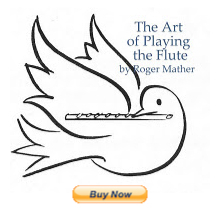 And concerning this topic, there is another book you recomend sometimes called "Illustrated flute playing" where the author, Robin Soldan, writes on Page 10 "The jaw is used a lot for making small adjustments to tone. Practise pushing the jaw backwards and forwards; avoid up and down movements (as in eating). Use only small horizontal movements". Why do you think he doesnt recomend up and down movements if it is obviusly the natural way to advance and pull back the jaw? I *KNOW*! It's a shock, seriously. Almost 90% of the time when the jaw is mentioned in flute pedagogy, they say "Move your jaw forward and back". This is also how I was taught in the 1970s, and by a student of Gilbert's. So imagine my shock when I overdid it and jaw-boned myself into jaw-strain (TMJ). My only choice was to stop moving my jaw forward and back. And when I read the "Jawboning" Flutetalk article by Walfrid Kujala, I finally had my answer. I think the jaw forward and back stuff is a mis-nomer and a bad way to exhaust your jaw hinge.